When Alia Russell moved to Newport, Washington, for a job at the Kalispel Casino, she knew it was time to retire her older model Toyota Camry. She needed a rig that could handle icy roads and winter driving conditions. She turned to Kalispel Auto Sales for help. The dealership is a venture of the Kalispel Tribe of Indians begun 18 months ago to address a long-recognized problem by the tribe: Too many of the tribe’s 470 members were paying exorbitant interest on loans for used automobiles. The dealership on the Kalispel Reservation in Pend Oreille County opened in July 2017, advertising “quality vehicles, reliably priced that are safe to drive.” It also sells to the public. Russell is the operations manager for the Kalispel Casino. She commutes about 20 miles between Newport – where she and her husband, Danny, live with their children – and Cusick, Washington, where the casino is. She figured she needed an SUV, but she had conditions. Berendt teased Russell, telling her she was looking for “a unicorn.” But the dealership was able to locate a vehicle she liked. 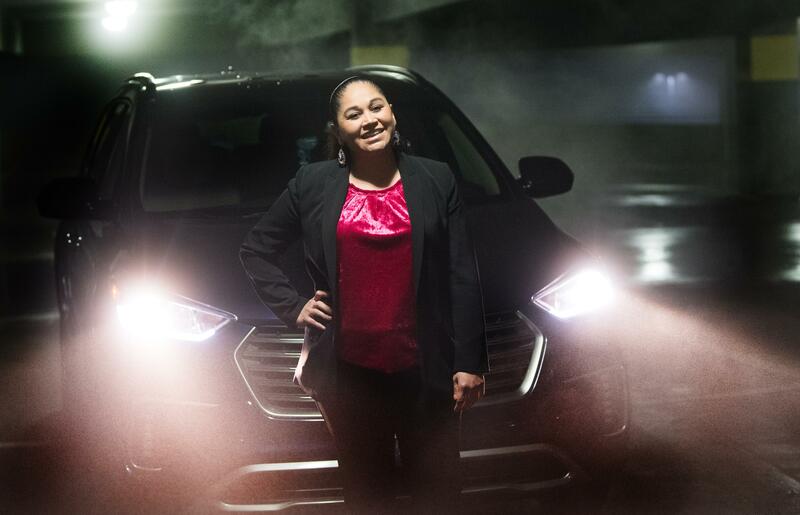 She bought a 2017 Hyundai Santa Fe in November with low mileage and a loan that fit her family’s budget. It’s the second vehicle Russell and her husband have purchased through Kalispel Auto Sales. The dealership finances vehicles for tribal members at favorable terms, Berendt said. “We’re better than competitive in the retail market,” he said. Depending on their credit history, tribal members can qualify for auto loans with interest rates as low as 2 percent. In the future, Kalispel Auto Sales would like to offer auto loans to nontribal members through a third-party lender at the dealership, Berendt said. Most of the dealership’s 90 auto sales have been to tribal members and tribal employees. But the used car lot on state Highway 20 also attracts interest from the public. At any given time, the dealership has about 15 to 20 vehicles for sale, offering a selection of sedans, trucks and SUVs, said Ray Walrath, the tribe’s regional business manager. Recent inventory included a $3,250 sedan and a $37,000 truck. The dealership buys vehicles through auto wholesalers and private-party sales, such as Craigslist. Some of the dealership’s trade-ins also are resold on the lot. The dealership vets the vehicles it sells, striving for quality and affordability, Berendt said. “I suppose every car dealership in the U.S. says that, but we put our money where our mouth is,” he said. In sparsely populated Pend Oreille County, vehicles from Kalispel Auto Sales will end up belonging to friends, neighbors and acquaintances, Walrath said.